Another one - keep hitting!! The city of Montreal could be forced to pay $21 million in damages to protesters caught in mass arrests during and after the 2012 student uprising. On Friday, Quebec’s Superior Court accepted to hear a class-action lawsuit on behalf of 1,610 people detained under the city’s controversial P6 bylaw. The city of Montréal will drop charges against 518 demonstrators who were kettled, detained, and abused on May 23 and 24, 2012 - citing lack of sufficient proof. The charges were pursuant to the infamous Bylaw P6, requiring advance notice of itinerary etc. All 518 persons were handed tickets for $634. The Le Devoir story quotes one demonstrator saying she had her hands cuffed behind her back with tie wraps, then was held for 6 hours, without access to toilet facilities. The real victory will come when the bylaw is declared unconstitutional, and when the city is required to pay damages. Stay tuned! And remember, the streets are ours! On May 28, 2012, André Bérubé and 83 others were arrested, handcuffed, and detained for several hours after participating in a demonstration in Québec City as part of the student strike movement. The pretext was violation of the highway traffic act. Bérubé - a veteran of the Occupy Québec movement - took the police to small claims court (!) alleging abusive arrest, and asked for $7,000 in damages. In a 31-page ruling, the judge blasted the cops and awarded the victim $4,000. He is encouraging others to follow in his footsteps. Bérubé is no stranger to small claims court. When police dismantled the Occupy Québec encampment in November 2011, Bérubé went to court. He won $3,100 for the attack on his freedom of expression. [url=http://ici.radio-canada.ca/regions/quebec/2014/09/17/005-printemps-erabl... story[/url] - I can't find anything about this in the Anglo media. As the city of Montreal tightens its belt-buckle and is cutting budgets, two Montrealers who are challenging the city's regulations around demonstrations are questioning the amount of resources the city is putting in to defend the bylaws. “It seems like there is room for austerity measures around everything except repression,” said Julien Villeneuve, better-known as Anarchopanda, in an interview. Documents obtained by Villeneuve and Jaggi Singh, both plaintiffs in their own separate court challenges against municipal bylaw P-6, show that the city has decided to turn to private lawyers in order to defend the regulation. The documents were provided to the Montreal Media Co-op for review by Singh and Villeneuve. An examination of the strategy being used in one of Canada's major cities to repress political dissent. Brutal police tactics and military weapons being used against senior citizens, young people and the press in an efofrt to criminalize even the most Basic exercise of civic and political rights. This model is ready for export to the rest of Canada for use against anyone trying to peacefully impact government or corporate agendas through the use of violence and economic pressure. This is coming to your town soon. On Thursday 23 October 2014, Judge Gilles R. Pelletier of the Municipal Court of the City of Montreal dismissed the cases of twenty-seven self-represented people who had been detained and given P-6 tickets at a demonstration on 21 April 2012. The cases were not dismissed because the judge recognized a violation of the protesters’ rights to assembly, expression, or protest, but because there were simply too many cases for the system to effectively process. Pelletier ended his decision by suggesting that P-6 cases are at risk of bringing the rest of the trials heard by the court to a crawl. And if no one has a concrete and realistic plan ... allowing us to process these cases within a reasonable delay, will it take a generous and anonymous benefactor to pay the modest sums at stake in these cases to stem this massive hemorrhaging of resources and funds, both public and private? In doing so, a person might successfully avoid this sabotaging of the sustained, daily efforts of all the players in our court system—judges included—to ensure that trials of defendants who are charged in all other cases, whatever their nature, are held within a reasonable delay. The judge lamented what he called a “Gordian Knot” that makes it impractical to prosecute P-6 tickets handed out en masse. The hearing of his appeal is finally over, and we're waiting for a panel of Court of Appeal judges to decide. Based on the legal arguments available to Nadeau-Dubois (which I think are quite strong) and what I've heard about the interventions of the Court of Appeal bench, I'm cautiously optimistic. Montreal’s municipal court has thrown out charges against three protesters levelled under Montreal’s controversial anti-protest by law dubbed P-6 for not giving an itinerary for a protest they were taking part in, because the law was not clearly written. In a judgment handed down Monday, Judge Randall Richmond ruled the three defendants, Éric Thibeault Jolin, Patrick René and one individual identified only as A.K., who were arrested during a protest march on March 22, 2013, close to Berri-UQAM métro station could not be found guilty because the section of the law under which they were charged is not clear that they should in fact be charged. The defendants argued they could not be charged with not giving the itinerary of the march they were taking part in because they had no part in organizing the march, and thus had no obligation to give an itinerary. In addition, they argued police failed to prove they were in fact protesting, and not just bystanders who were rounded up during the police arrests of alleged protesters. However, in his ruling, Judge Richmond notes that under article 2.1 of the law under which the defendants were being charged, nowhere does it in fact state that it is illegal for a person present at a protest to not give the outline of their route. It is mentioned in other parts of the law. He suggests that lawyers perhaps forgot to add that part when they drafted the law, and that legislative changes are necessary to modify it. Challenges of P6 as unconstitutional, as well as class actions, are still working their way through the courts. Coderre claims the bylaw is "still valid", but there has been no decision on that point yet. Another victory - big one! Today Justice Guy Cournoyer of Quebec Superior Court ruled on the case of a protester arrested and ticketed in 2011 under article 500.1 of the Highway Safety Code, which outlaws “any concerted action” intended to block traffic. He gave the government 6 months to amend the code to bring it into conformity with his ruling. This decision is expected to lead to the dismissal of all outstanding charges and tickets filed under the law. No, the Randall Richmond decision was not the work of students... it was a particular conspiracy that was in the planning stages starting as early as 2013. On 20 October 2014 that is when they were introduced to this possibility. The prosecutor was at a loss, he originally admonished the defendant for not serving a copy to the attorney-general, but he replied correctly that a 184.7 Code of Penal Procedure request requires no such thing, this was a matter of statutory interpretation and that did not require a notice to the attorney-general or anyone other than the prosecutor, who received the notice but forgot to read it. Defendant was ready to go right there but the judge insisted that the case be put off until March. Then, less than a month later, the same person noticed that this very excellent judge was supposed to start trials for another group beginning on 20 November. Moreover, not only did this judge make the sort of judgement we wanted one month earlier in a parking ticket affair, believe it or not, (very convenient to cite to him his own decision). but he also made the closest thing to a correct 500.1 interpretation and also took seriously errors upon tickets as spotted at another default trial in which he acquitted the accused... so this was the judge we wanted, and he would get to hear it first, and for a different type of ticket than the one already scheduled, this was the new itinerary provision one never before judged, making it more vulnerable than the other ticket that had been judged before even though the tickets were equally bad. What people should know is that the P-6 has a particular scheme. It defines three types of illegal events (danger to peace, public order and safety, lack of itinerary, a ban by the Executive Council) and another provision states that it is illegal not to leave the scene of such an illegal event upon the order of a police officer. However, they were giving out tickets for "having participated or been present" at the illegal events based on the provisions defining the events. Thus, the tickets were all bad and these offences did not exist and the essential element of the police order was absent. Supreme Court decision Blouin v Longtin et al 1979 was used to force the judge to accept our scheme as it was directly on point with the P-6 scheme, and also we had the Interpretation Act Article 41.1 that states more or less that an interpretation where a provision has no reason to exist is not acceptable and according to the prosecution's interpretation the provision including the police order is useless if the definition provisions create offences as these would be the very same minus an essential element... which makes it totally useless. In order to force the judge's hand, a subsidiary argument was made up to claim that if the definition article DID create an offence known to law it would be for having "held" the event, as it speaks of events that may "not be held" or "held in violation". That using R v MacIntosh 1995 that we must not legislate from the bench, we must take what is written, that if it did create an offence, it would be for having "held" the event, and this would make the claim of "participate or be present" being an offence seem more far-fetched... and thus, we had a three part decision. 1) The ticket is invalid as the offence does not exist under any law, the provision creates no offence. 2) If it did create an offence it would be for having held the event and there is an absence of evidence the accused are organisers. Yesterday, the Supreme Court heard the appeal of Gabriel Nadeau-Dubois's exoneration on a contempt charge by the Québec Court of Appeal last year. Here is an [url=http://www.ledevoir.com/societe/justice/468688/la-dangeureuse-judiciaris... letter[/url] by 50 Québec civil organizations supporting freedom of speech and denouncing the draconian injustice of GND's original conviction. It's good that she is recognized as a criminal. It's not good that she was never even charged for her crimes of pepper-spraying innocent folks during the student strike. Given her family name, my personal feeling is that she should be named ambassador to Ireland after the other out-of-control testosterone type is ordered home. What have the Irish people done to deserve such a punishment?!? In the judgement released this morning, Justice Chantal Masse ruled that the two most controversial provisions of the bylaw are null and void: article 2.1 which required police approval for protests and their route (as it relates to “spontaneous protests”), and article 3.2, which restricted the wearing of masks during protests. In the case of article 2.1, the ruling found that spontaneous protests are protected under the constitution, although Masse ruled that an itinerary can be required for protests that are planned and advertised ahead of time. Consequently the article was ruled void in cases of spontaneous protests. Bravo Anarchopanda, for waging this legal battle for the past four years!! Villeneuve says he will continue with his own appeal of the ruling, fighting against an article of the bylaw that was upheld by Masse – the requirement that protesters file an itinerary with police before a planned demonstration. 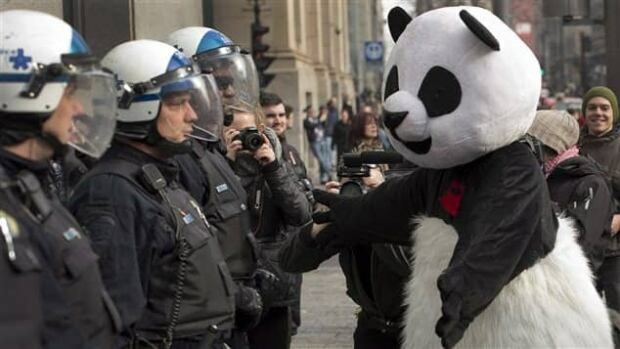 Anarchopanda wins: protesters won't be required to file an itinerary. And in English - such great news - so many victories - we need more! Yes, it pleasant to savour these small and not-so-small victories, after all the lies depicting the movement as either violent or puerile. This scumbag should be locked up for life. But cops who shoot and wound unarmed protesting youth are not even fired. Welcome to Gaza.